Preheat oven to 350°F. Line cookies sheets with parchment paper, or spray cookie sheets with non-stick cooking spray. In standing mixer with paddle attachment, cream the peanut butter, butter and sugars. Add eggs and vanilla, and mix until well combined. Add oats and baking soda, and mix until well combined. Add chips and M&M's, and stir until well combined. Drop the cookies by tablespoonfuls (I use a tablespoon size cookie scoop) onto prepared cookie sheets. (Note: I dropped cookies onto wax paper lined cookie sheets and froze them for a couple weeks before baking). Bake 10 to 12 minutes. Cool for 5 minutes on cookie sheets then transfer to wire racks to cool completely. Makes about 4 dozen cookies. Diabetes runs in our family and we are always looking for recipes that the entire family can share. In a small bowl, combine flour, cornmeal, SPLENDA®Sugar Blend, baking powder, and salt. Stir with a fork. Add butter and cut into dry ingredients until pieces are pea-sized. Add buttermilk and stir until just moistened. Drop crust batter over fruit. This would make either a great dish to take to the party or a great gift from the kitchen. In a small bowl combine oil, cumin, and garlic powder and stir. Brush the seasoned oil mixture onto the cut side of both bread halves with a pastry brush. Spread salsa evenly on top of bread halves. Sprinkle the halves with the Mexican cheese and top with crumbled Parmesan cheese. Place into 425 degrees oven. Bake 8 to 12 minutes, or until cheese is melted and bread is good and crusty. While the bread is baking, prepare the relish. In a medium size bowl, mix avocados, lime juice, cilantro, scallions, garlic, celery salt, and salt to taste and set aside. Remove the bread from the oven. Allow cooling a few minutes. Using a serrated knife, slice bread halves across into 2-inch strips. 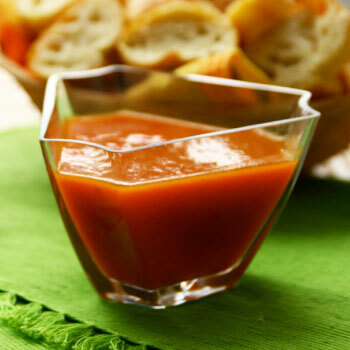 To serve put salsa bread strips on a nice plate or platter with avocado relish in a separate bowl. 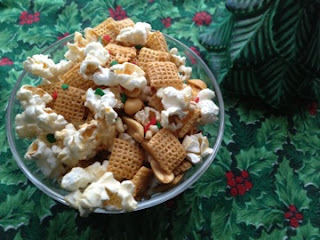 Tonight while watching Christmas movies sitting by the Christmas tree you should make up this Christmas treat and create some Christmas memories. There you go I said Christmas 4 times in a sentence. That is the next holiday we will celebrate and to us it is very special. We love snacks that provide great munching. This snack is also easy to bag up and throw in lunch boxes. Swee, salty and crunchy is all provided with this recipe. Years ago my grandmother would make caramel popcorn balls. They were wrapped in green and red paper and shared on Christmas day. Mix popcorn, cereal and peanuts in a large microwaveable bowl. In a medium microwaveable bowl, add butter, brown sugar, corn syrup and vanilla extract. Microwave 1 minutes. Stir. Microwave another 1 minute, until bubbling. Pour over popcorn mixture. Stir. Microwave popcorn mixture for 1 minute. Stir and scrape side of the bowl. Repeat microwaving and stirring 4 - 5 times. When the mixture comes of the microwave the last time, shake on sprinkles and stir. Spread mixture on lined baking sheet. Allow to cool. Store in an airtight container. I have been hearing alot about snow While we dont have any (nor do I want any) it is getting colder here. The cold indicates that the snow maybe here sometime soon. These cute Snowmen will provide a great snack while the snowflakes float down. Then remove to a wire rack and completely cool. 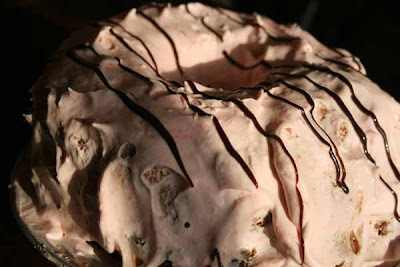 Frost first layer with cool whip and top with sliced strawberries on top. Add the second cake layer and frost top and sides with more cool whip and top with more sliced strawberries. Save one whole strawberry for the middle of the cake. Gently slice and fan the whole strawberry, Place on top in the middle of the cake. Notes: depending on what brand of cake mix you use. Follow the directions on the back of the box substituting strawberry soda for the amount of water listed. Also add the amount of eggs and oil stated on the mix, I use Duncan Hines. Don't allow those holiday crowds to destroy your holiday spirit. Stay awy from malls, store sales, and rush by shopping at home online. Just beware of shipping and insurance as they can make your trip unsuccesful by having to pay more. We are all so busy during the holidays with this event and that event not to mention the parties that we have been invited to. It is o.k. to say no and only attend those that you feel closest to. There are those candies that are for every day but then there are candies that are for the holidays. Fudge is one of those special holiday recipes I only make during the holidays. Don't worry though I don't just make one or two batches oh no I make several. One of the newer ones is Orange Dreamsicle Fudge. I found this one while sampling at the local craft fair. There was a lady who was set up with many flavors of fudge. Yep, you got it there was an orange dreamsicle variety and I had to try it. A stress-free Christmas would be an awesome thing. Normally there is stress somewhere because of everything that needs to be done. The Christmas Pictures, wrapping gifts and the parties. Don't let the many things that on your to-do list bring you down. The Celebration of Christmas and the reason for the season being the Sweet Baby Jesus should be in the front of everything else. Take time and have some family time where adults make one list and children make another list of gifts they would give the world. When the list are complete take time and exam the list how different are they?? Have a family discussion about the list. 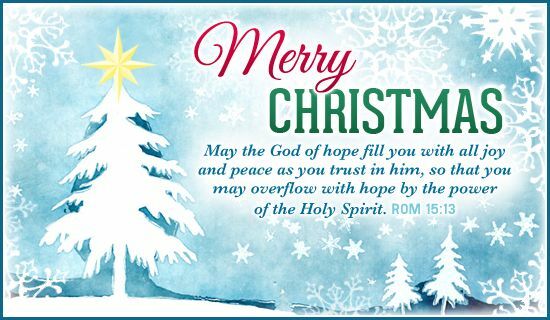 Share with each other how much better the world would be if we loved each other like the Jesus loved us when he was born all those years ago. Take time and prepare a special meal for someone who may be ill, hurt, or just need a bit of company. My grandmother would always make up several Swedish tea rings and deliver them as she would Christmas gifts keeping in mind to deliver them prior to Christmas Morning. Roll up jelly-roll style, starting with a long side; pinch seams to seal. Place on greased baking sheets; pinch ends together to form a ring. With scissors, cut from outside edge two-thirds of the way toward center of ring at 1-in. intervals. Separate strips lightly; twist to allow filling to show. Cover and let rise until doubled, about 1 hour. Note: I placed the cake into the freezer for a couple of hours prior to slicing it. It made the job much easier. 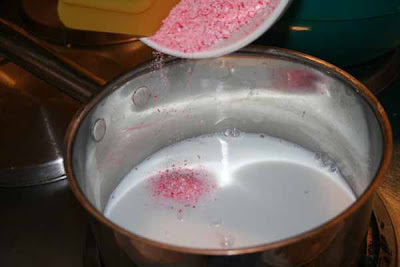 Put candy in milk; heat and stir until dissolved. Soften gelatin in water and add to milk and candy mixture. Chill until it starts to set. Fold into whipping cream. Spread cream mixture over bottom layer of cake. Drizzle chocolate syrup over whipped cream mixture. Place another layer of cake and repeat. Repeat with third layer. 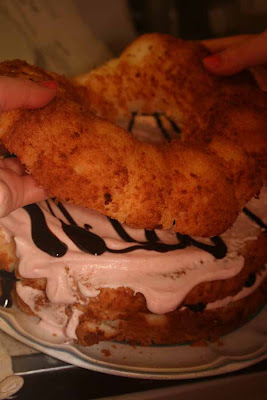 Cover outside of cake with whipped cream mixture. Chill and serve. Makes 12 serving. Our family has always given gifts from the kitchen. Whether it be fudge, candies, cookies, or something else we have always gifted them to individuals we love. Sugar cookies is one of those things that never get done right in our house. I have even found when my girls were younger that they would eat the dough as it was sitting in the fridge to chill. Then if it makes it through the chilling period you still have the rolling, cutting, baking and decorating. It normally takes a day or two. 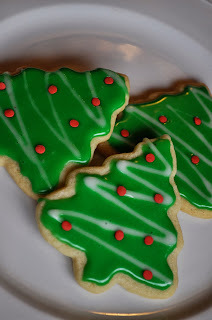 I love good sugar cookies at Christmas time as I had these made for me when I was a young girl. But between work, family and my time I run out of time. So if you are like me then you may just love these sugar cookie decorating kits. In a large mixing bowl cream butter and sugar. 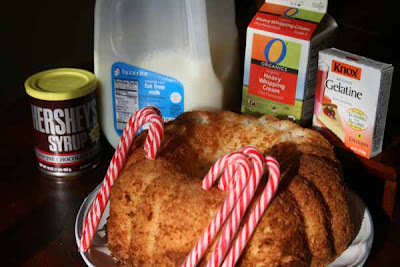 Add eggs, soda, baking powder, milk, and vanilla. Mix well. Add in one cup of flour at a time until the dough is a rolling consistency. Not too sticky. Once the dough is mixed separate into 5 logs and wrap in plastic wrap. This dough recipe will make 5 Cookie Baking Kits. Mix all together. Mixture will be thick and shiny. Note- Divide icing evenly into 5 ziptop plastic snack sized baggies and seal. Keep refrigerated until ready to use. Use within 5 days or freeze. On a floured surface roll out chilled cookie dough to 1/8 thick. Using the provided cookie cutter, cut out as many cookies as you can. Place on a cookie sheet and re-roll dough and continue to cut cookie dough until all the dough is used. Decorate a few with sprinkles prior to baking- press sprinkles gently into dough. Bake in 500 degree oven on the bottom rack for 3 minutes then the top rack for 1 minute. Watch closely that they do not burn. Remove to cooling racks. To decorate with the provided icing, snip a small corner of the plastic bag off and decorate cookies with pretty designs. Enjoy! 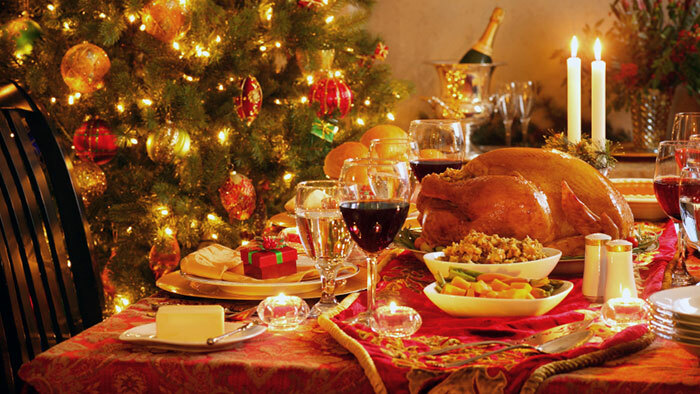 During the holidays there are great gathering that we all go to and take a special treat with us as well. Because of my busy schedule the recipe often has to be easy to prepare. We often bring our favorite dish to the gathering and sometime we bring a dish that we love that smells delicious and on that we greatly want to try our selves. 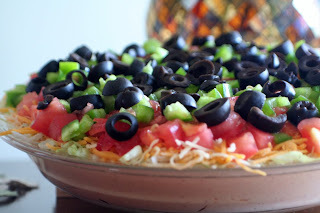 Because of the love we have for Mexican food this taco dip is a favorite of ours and it is always a crowd lover at the holiday parties. I have told the story of my aunt and her sugar cookies many different times. My aunt Ruth was a very shy lady but she made up for it in the things that she did. She was very talented in music, art and in the kitchen could do magic it seemed. The beauty of the cookies that she would bring on a paper plate to our house each year was amazing. Mom would make us look first because they were so magically made. She then would let us select the one that we thought was the best. Oh my when we finally got the cookie in our hand it was something more than a simple treat. I would sit around with my brothers and sisters and have a great time talking about the treat that one of our favorite aunts had brought us. Cream butter and sugar on high until well mixed. Add in egg and extracts and continue to beat. Slowly add in dry ingredients while mixing. Remember to scrape down sides of the bowl. Knead the dough briefly and roll out on a floured surface. Cut into your desired shape using cookie cutters. Place on parchment lined baking sheets and bake in 350 degree oven for 9-11 minutes, until very slightly golden brown. Set cookies on racks to cool while making glaze. Mix powdered sugar, corn syrup, and milk in a bowl. If your glaze is too thick, add 1 tsp more milk or water and if it becomes to too thin add some powdered sugar. (For candy canes and Christmas trees, make one batch regular white glaze and a second batch with green dye) To decorate, put glaze in ziploc or piping bag and cover cookies with glaze and use a utensil to help spread and smooth out glaze. Use festive sprinkles or sugar crystal to decorate if desired. Let glaze set up on baking racks until fully dry and hardened. 4. Remove meat from crockpot. Slice meat and pile up on toasty, cheesy bread. Reserve leftover juices in crockpotfor dipping. Don't skip this step! The au jus makes this sandwich so incredible! The date of December 7, 1941 will forever be remembered. It has been etched in many of the elderly individuals I care for. I grew up respecting this day as well. America was changed forever and our safety of isolation had disappeared forever. We were invaded on our own land and our innocence as a country was gone. The United States will never forget the historical event on December 7th many years ago. To those who perished December 7th 1941 after the Japanese attacked Pearl Harbor a memorial of the USS Arizona stands as an honorable memorial. It was the USS Arizona battleship that was bombed an sunk during Japan's surprise morning attack on Pearl Harbor. More than 1500 military personnel aboard the ship were killed. This was the greatest loss of life ever in an attack on the U.S. warship and the reason that the U.S. entered World War II. While winter is here the thought of the choices of all the goodies available at the fairs has my mouth watering. One of my favorites is cotton candy. December 7th is National Cotton Candy day. This sweet light treat that melts in your mouth has a day all of its own. Cotton Candy is a treat made in America. It was two Tennessee candy makers that invented the cotton candy machine. In 1897 William Morrison and John C Warton invented the machine and later took it to the 1904 St. Louis World's Fair. The men refereed to their treat as "fairy floss" and sold the treat to fair goers for a quarter a box. While at the time this was quite a price more than 68000 boxes were sold at the fair. The Gold Medal Products of Cincinnati Ohio invented an updated cotton candy machine. Since that time they have been the top manufactures of all cotton candy machines. The machine works by melting the sugar until it becomes a liquid and then the liquid sugar is spun through tiny holes in the machine. The holes help shape and cool the liquid. As the sugar cools it becomes solid again. 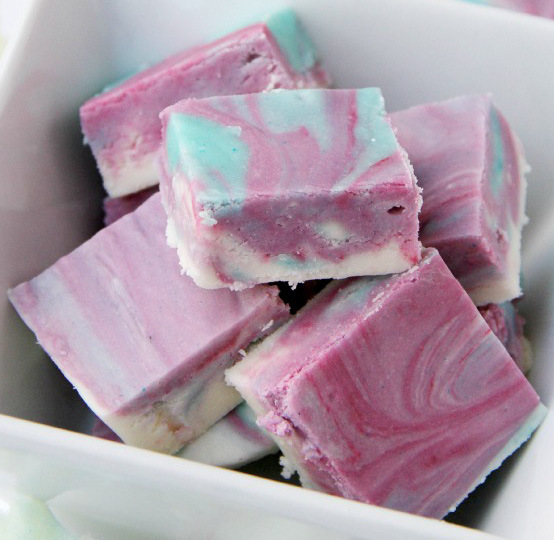 Since it is December and less than 3 weeks from Christmas I thought I would share a delicious cotton candy fudge. Line a 13×9 inch pan with foil and spray with nonstick spray. Combine sugar, butter, heavy cream and butter in a saucepan, cooking and stirring over low heat until the sugar is dissolved. Once the sugar is dissolved, bring the contents to a boil while stirring for about 4 minutes. Remove from the heat and mix in the marshmallow creme and vanilla chips until all of the chips are melted. Pour 3/4 of the mixture into the foil-lined pan. 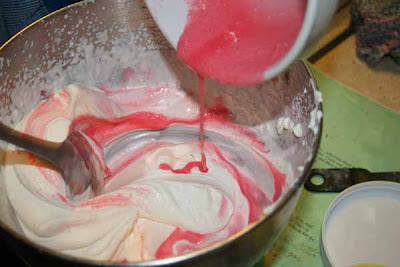 Add the cotton candy flavor mix to the saucepan and stir until well mixed. Drop or drizzle spoonfuls of the cotton candy mixture over the mixture already in the pan. Add 2-3 drops of the pink food coloring in various areas on top of the fudge in the pan, and then cut through the fudge with a butter knife to make the swirls. Cover and allow to set in the refrigerator. Remove the fudge from the pan by picking up with the foil and then cutting into squares. There is never anyone more important to cook or bake for than my family. That may just be my own opinion. Around the holidays I will bake more than usual. 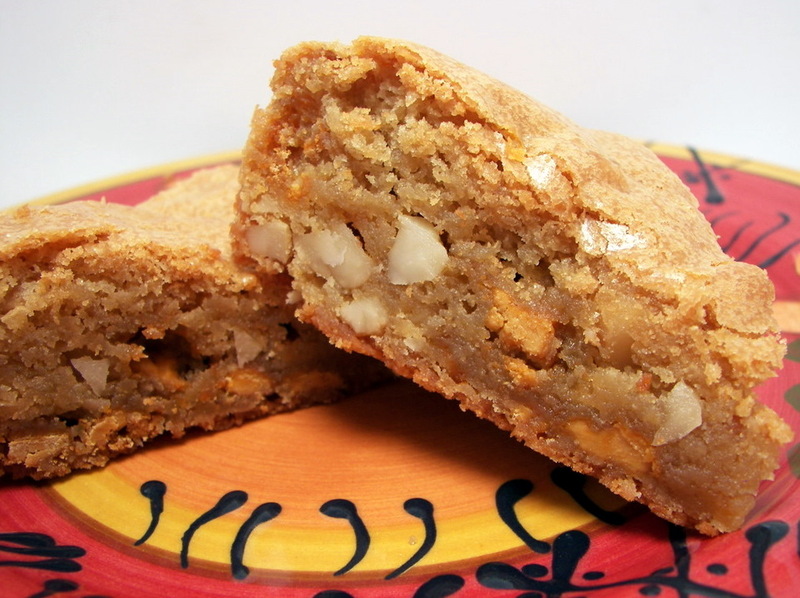 This recipe is one of my favorite because of the delicious macadamia nuts included in the mix. I forever have loved Macadamia nuts in cookies now you must try them in these delicious blondies brownies. In a medium bowl, whisk together flour, baking powder and salt. Now in another bowl a bit larger mix butter, brown sugar and granulated sugar til light and fluffy. Beat in the eggs one at a time. Mix til all combined. Stir in the maple extract Add the dry mixture and stir with a wooden spoon just til combined. Fold in chips and nuts.